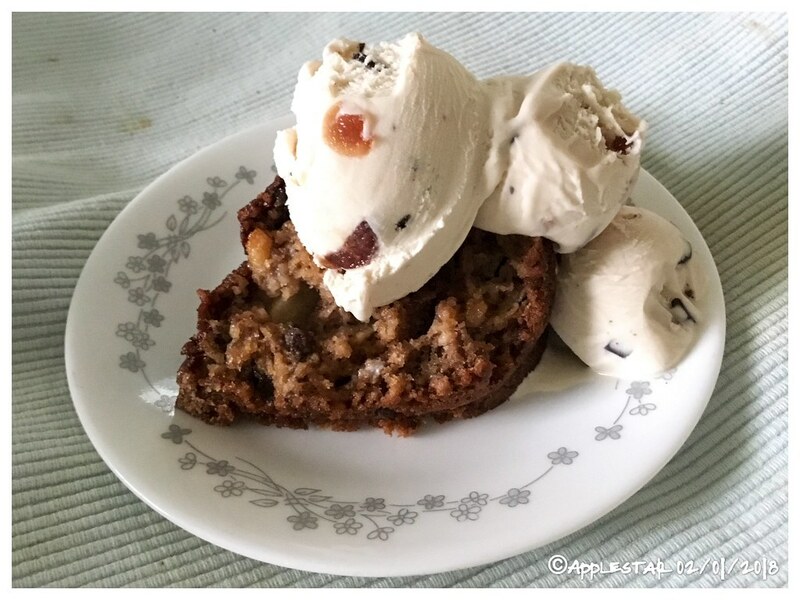 When I first started looking for a good apple cake recipe, I came across several kinds, including yeasted recipe — maybe more like a bread? I keep thinking about trying that one, but usually end up making this other one which I first selected to make for my DD’s apple themed birthday party at a rented party room in the farmhouse at a historic preservation farm during their apple fest week (they were offering demonstration apple cider-making and fresh apple cider, apple-head making craft, etc). It’s a rich pound-cake based recipe using lots of butter, eggs, and cream. has been our “go to” apple cake for over 10 years. My DD has asked for it for her birthday cake many times since that first time. But when I went to search for the recipe to post about it, a more recent apple cake recipe using grated apples seems have superseded it at Cook’s Illustrated. (Maybe it’s still available at the $ site). I used a Bundt pan (the original reason for using the hole-in-the-middle pan stated in the previous recipe still holds). I used 1 cup cake flour and 1-1/2cups whole wheat pastry flour and 1 cup coconut meal from making coconut milk, 1 cup cane sugar, 1/2 cup brown sugar, and 2 tbs honey, modified the 1 cup raisins into mostly raisins+1/4” diced dates,apricots+a handful of frozen wild strawberries from the summer garden — and soaked them in 2 tbs DiSaronno and 1 tbs lemon juice, then mixed in the diced apples while I prepped the rest. I toasted the walnuts first before chopping them. Then thoroughly coated the fruits and nuts with the flour mixture. And one major change I made was to add the unblemished peeled apple skins by liquefying them in the blender with sunflower oil, sugars, and eggs. Folded in the liquid just enough (no more dry clumps) then spooned into the pan, buttered and floured (with some the flour mixture BEFORE adding baking soda). The cake turned out tender, hearty, moist, and delicious. We have been eating it with ice cream. ..this is what you get when you ask your -well *my*- hubby to scoop the ice cream. He asked me if this was “enough”..... I decided to try it with B&J’s Cherry Garcia today. Last edited by applestar on Thu Feb 01, 2018 9:31 pm, edited 1 time in total. Reason: HAD to add a photo! Mix, sugar, eggs, butter, vanilla. Mix at high speed 5 to 7 minutes until sugar dissolves and the mixture looks like whip cream. Stir in room temperature buttermilk. Mix, flour, cocoa, salt, baking powder, together then slowly mix it into the liquid. Bake at 350 degrees until done. Small cup cakes about 20 minutes, large cup cakes 25 min, 9x12 pan 30 to 35 min, bunt pan 45 minutes. 1 1/4 cup butter soft, 2 tsp vanilla, 8 to 9 tablespoons milk, 7 1/2 cups powdered sugar. After cake was cold I heated the frosting so I could drizzle it over the cake. Then I added the chocolate chips. I was side tracked for about 15 minutes when I returned the frosting had cooled. When I sprinkled on the chopped nuts they bounced off. LOL. Remember to sprinkle all the toppings on while frosting is still soft. Sometimes I make 2" cup cakes and sometimes 3" cup cakes. Some times 9"x12" cakes. Sometimes I do 2 layer cakes & sometimes 3 or 4 layer cakes. Bunt pan is my favorite shape. Sometimes I leave out some of the liquid and do drop cake cookies. Kids love the cookies especially if you let them do the frosting & sprinkles. Sometimes I cheat and buy a cake mix but its not as good as this scratch made cake. Recipe shows white frosting. If you want chocolate frosting leave out 1/2 the sugar and replace it with cocoa powder. It takes 1 cup of frosting to drizzle a cake and 2 cups to plaster the whole cake with frosting. I don't like extremely sweet frost or extremely sweet cake, drizzle gives you 1/2 the frosting & 1/2 the sugar. Too much sugar hides the good chocolate flavor. Sometimes I make chocolate cake with no frosting. Sometimes I put chocolate chips inside the cake. Last edited by Gary350 on Sun Feb 11, 2018 3:41 am, edited 5 times in total. Someone tell me how to upload 2 pics to the same page? You can click on [place in-line] to add the codes and wherever the codes are in the text is where the picture will be inserted. To add more pictures, Click on (upload attachment) and you will get the same sequence for finding the file you want to upload from your computer. The chocolate cake looks yummy! I need to go buy cocoa powder. I will try uploading 2 pics on same page next time.